Macon Blair is an unlikely assassin in “Blue Ruin”. One of the most original, suspenseful, and surprising indies in the past few years, writer-director Jeremy Saulnier’s Blue Ruin is a mesmerizing exercise in style and character study. Granted, that last bit is enough to make many a movie-goers’ sphincters clinch with dread of ponderous, talky self-indulgence, oblique references to obscure film movements, and/or overblown visual flourishes; however, Saulnier’s is a more assured hand, and his film boasts a sharply focused, unwavering economy of storytelling. 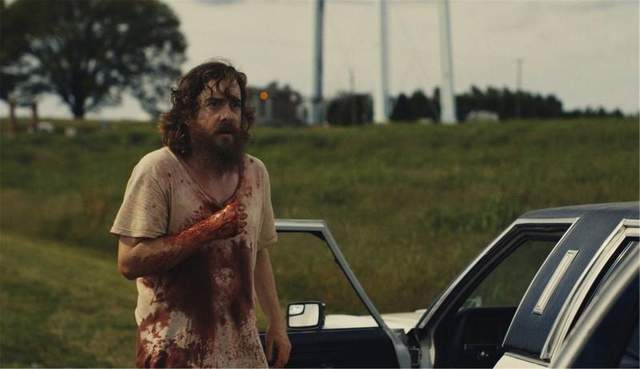 Blue Ruin is a lean, mean, and unpredictable revenge flick. We’re given an unlikely avenging protagonist in the form of Dwight (Macon Blair), a homeless recluse living out of a battered but somehow functional blue Pontiac parked along the Virginia shore. His pitiful yet peaceful existence is shattered when he learns that Wade Cleland (Sandy Barnett), the man responsible for murdering his parents, is soon to be released from prison. The notion fills him with an ugly purpose as much as it terrifies him, and when he wreaks bloody vengeance early in the film, it sparks a violent feud with the Cleland family, one defined by ugly family secrets going back decades. All of which would be trite and clichéd in the hands of many other filmmakers; however, Saulnier subverts audience expectations by sticking with the notion that the simple art of murder is anything but, by exploring the ripple effects of such an act (Dwight’s actions put his estranged sister and her family in grave danger), and by giving us an anti-hero who definitely does not fit the mold of a steely nerved killer with ice water in his veins. As played by Blair, Dwight is a mild-mannered sad sack with a serious dark side, an incompetent criminal who nevertheless has enough wits and determination to navigate the mess he creates. He’s also greatly out of his depth in it, and Saulnier squeezes a great deal of tension and suspense from that set-up, laces it with dark humor, and punctuates it with bursts of shocking violence — all the while keeping Dwight front and center as a man in over his head and painfully aware of the fact that he has been for some time. Your father is a man of wealth and taste.